Columbia developer Bob LeMone, pictured outside his office at Little Dixie Construction Co., has almost fully recovered from a serious brush-clearing accident last summer. Psychologists say there are two choices when confronted with a threatening situation — fight or flight. Columbia builder and real estate developer Bob LeMone doesn’t seem to know there’s a choice. He just fights. "There’s hundreds of stories about him and all the fights he’s been in," said MBS Textbook Exchange CEO and close friend Bob Pugh. "They couldn’t beat him because he wouldn’t quit. He will always answer the bell." Most people conform to predictable lifestyles and social norms. There’s safety with this approach, and it’s easier. But a few folks are wired differently. They go for the gusto while ignoring many of the lines and signs drawn by others. LeMone has cut his own path, and he has attracted hordes of friends and some rivals along the way — friends intrigued by his refreshing uniqueness and rivals threatened by his tenacity. "He knows thousands of people," Pugh said, "and they all know him the same way. He’s a great storyteller. He’s a hard worker. And don’t compete with him in his business — you’ll end up losing more times than winning." The stories about his business accomplishments are impressive enough — he probably has built more square footage in Boone County than anyone else — but it’s the personal stories about his grit and drive that people remember the most. LeMone has gone head-to-head with every form of danger imaginable. He’s wrestled a bear. He’s been run over by a car. He’s gotten his head caught in a lawn mower. But he always manages to fight his way out. "He’s the toughest guy I’ve ever known," said longtime friend Woody Widenhofer, a former University of Missouri head football coach and now head coach at Vanderbilt. Widenhofer played MU football with LeMone in the early ’60s under coach Dan Devine. "He would’ve been a great football player," said Widenhofer, who coached linebackers for the Pittsburgh Steelers from 1973-1983, "but he was undersized as an offensive guard." LeMone already was starting to forge his tough-guy image before he took to the gridiron at MU. In February 1960, he was a 17-year-old Hickman High School football and track star when he won the 175-pound Kansas City Golden Gloves championship. Terry Gibson, a LeMone buddy since the fourth grade, recalls that his friend’s match in Kansas City was a lark. The local boxing club needed some kids to fill a few spots on the team, and LeMone enlisted even though he had no formal training. A newspaper reported that the Kansas City match was a "spectacular struggle which brought a crowd of 5,000 to its feet in a hurry." LeMone "unloaded a terrific right-hand wallop" that knocked his opponent cold in the second round. LeMone’s next sport-fighting event didn’t go as smoothly. In the summer of that same year, the Cooper County Fair held a contest to see how long a challenger could stay in the ring with a bear. The cost was 50 cents for a chance to earn $1 for every minute in the ring. LeMone’s friends coaxed him to fight the bear. "It was hilarious," recalled Boone County National Bank lending officer Jim Bornhauser, who was there. He said the event was played up just like a boxing match. An announcer shouted: "In this corner, Golden Glove winner Bobby LeMone." LeMone put his hands in the air and danced. Everybody cheered. "And, in this corner, the bear." Everybody booed. The bear — declawed, muzzled and on a tether — was trained to toss people out of the ring. Most lasted less than a minute. After 20 minutes, LeMone was exhausted and asked the contest promoter, "Mister, when can I quit?" That’s how LeMone remembered it. Bornhauser thought he saw LeMone get tossed out of the ring, but he doesn’t remember for sure. In any event, LeMone got $20, and his friends got another story. "All my fights were supervised," LeMone said wryly when pressed about his reputation as a young brawler. "But I’ll take up for the underdog all the time." LeMone might have considered himself to be one of those underdogs. He was 5 years old when his father, Columbia physician David LeMone, died of a heart attack at age 43 while on a vacation in Colorado. His daughter Tracey believes the loss strengthened his resolve. "He didn’t have a father," she said, "so he had to do everything on his own." Last June, LeMone found himself in a fight for his life while clearing brush with a large John Deere rotary mower at his Arrowhead Lake residential development. He stopped to clean one of the cutting blades, raised parallel to him by hydraulic lifter arms. A leak in the hydraulic system made it necessary to keep the engine idling to maintain enough pressure to hold the blades upright. The machine was on a slope, so LeMone asked a co-worker to engage the emergency brake. Instead, the worker accidentally pulled the blade’s power release lever. The blade whirled on at full power and sliced through LeMone’s scalp, wedging pieces of his skull into the brain. LeMone remembers being on the ground, struggling to breathe. He heard his co-worker yell hysterically, "I killed him, I killed him." Dazed and bloody, LeMone fought to remain conscious, fearing that if he lost touch and passed out he wouldn’t wake up. During four hours of surgery at University Hospital, neurosurgeon Edward Colapinto carefully removed bone fragments from LeMone’s brain and used tiny screws to fit them back together like a jigsaw puzzle. Colapinto said it’s hard to say exactly how close the blade came to causing a fatal injury or permanent paralysis, but it was definitely life-threatening. "He’s had an extraordinary recovery," he said. LeMone summed up the episode with a characteristic verbal economy. "I was lucky," he said. "It wasn’t my day." After surgery, LeMone was moved to Rusk Rehabilitation Center for a month of exhaustive daily physical therapy. "He worked really hard with drive and determination," Rusk case manager Lisa Scott said. "And that’s what it takes." There’s still some immobility in his left arm and hand, but LeMone’s recovery is almost complete. He’s gone from 48 pills a day down to two. On doctors’ orders, he now shuns alcohol. He also attends church more and plays cards less. His therapy continues, and he’s determined to regain full strength. Friends marvel at LeMone’s alacrity after the near-fatal mishap last summer. "When I saw him right after the accident, he was not in good shape," Pugh said. "His arm was cut, and his head was sliced open. Bob told me that the brush hog hit him harder than the bear." LeMone checks the progress at MBS Textbook Exchange, where his construction company is working on a building expansion. LeMone, 57, went to MU on a football scholarship, but he quit school after two years and went back to construction work. In 1964, he hired on with Little Dixie Construction Co., a company started that year by Columbia real estate investor Paul Medley. LeMone was a good hire. "He’s the hardest-working man I’ve ever known," Medley said. "He loves to work. He’s always getting after it. He’s had his back fused, he’s fallen off buildings, and he got run over by a car on Interstate 70." The interstate mishap occurred in December 1969 as LeMone drove home from work one night on I-70. A hay truck stopped on the highway in the dark, and LeMone didn’t see it in time. On impact, his truck door flung open and he was thrown onto the opposite lanes. LeMone was hurt but struggled to crawl off the road. He didn’t make it. A car ran over his back. Local physician and family friend Frank Dexheimer remembers racing to tend to LeMone at Boone Hospital. A nurse told the doctor that LeMone was a goner — his lips were purple, and he had difficulty breathing. When he heard the news, Medley remembers, he said, "I think he’s had it this time." When Dexheimer examined LeMone, he found both lungs weak but working. There were no apparent abdominal problems, and his pulse and blood pressure were stable. X-rays found no fractures, although several ribs were cracked or separated from the sternum. "He’s a tough son-of-a-gun," Dexheimer said. "Tough as nails." LeMone thinks his thick layers of winter work clothes saved his life. A few days later he was at a New Year’s party down at the Lake of the Ozarks. LeMone likes to build things. He always has. Close friend Pat Mitchell, a business executive in the Chicago area, said LeMone’s favorite toy was an Erector set. "That’s where it all started," Mitchell said. "I asked him once about all his accomplishments in the construction business, and he said, ‘Remember the Erector set? 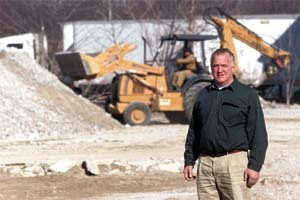 There’s not a hell of a lot of difference.’ "
In December 1981, LeMone purchased Little Dixie Construction Co. from Medley. In 1990 he hired Medley, completing a full circle in their relationship. While he’s never figured the total square footage he’s built, his company bills about $15 million a year and employs 50 to 75 people, about three times the staffing level when he bought the company. Little Dixie’s major local projects include MBS Textbook Exchange, Home Depot, the former Datastorm building at 2401 LeMone Industrial Blvd., hangars at Columbia Regional Airport, Perry Chevrolet, the Expo Center, the Senior Center, Dana Corp. and the $5.2 million Boone Retirement Center now under construction on Bluff Creek Drive. 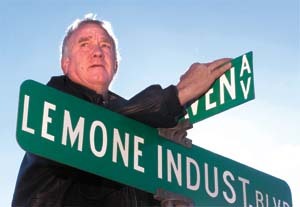 Along with his construction projects, LeMone also develops business parks and residential property. He’s a partner with Jeffrey Smith in two parks in Lee’s Summit and one in Boonville. He owns the Concorde Office and Industrial Plaza at Highway 63 and Route AC. He has partnership interests in the Concorde East Industrial Park at Interstate 70 and Route Z and in the 265-acre Arrowhead Lake Estates residential development. This spring, he plans to begin construction on a 96-acre planned light industrial complex on the west side of Highway 63 about two miles south of Columbia. LeMone gets attached to his buildings like he gets attached to his friends. "He’s our unofficial building superintendent," Pugh said. "He looks after a building even after it’s built. He comes around to look it over. He notices leaks or if it needs paint." And there is no line of demarcation between LeMone’s work and his social life. He zips around dozens of construction sites throughout the region, keeping an eye on things and connecting with friends. LeMone likes to build, but he pays attention to the business side. "He’s an intelligent, shrewd and tough businessman," said Pat Wilson, who has been LeMone’s personal assistant since 1986. Wilson manages LeMone’s personal assets in a separate office across from the Little Dixie office on LeMone Industrial Boulevard. Tall file cabinets run the length of one wall. Inside are files on contracts, leases, land deals, partnership agreements, bank loans, stocks and other documents. Wilson said LeMone knows where everything is. "He may look disorganized, but he’s not," she said. "He’s has a memory like a steel trap. "Tracey said her father has also built good relationships. "He always has good advice and taught responsibility," she said. "If you get into a mess, he taught that you’ve got to get out of it." Tracey likes to remember the bass fishing tournaments she and her sister, Trisha, used to go on with their father in his "big fancy boat." "He ran it wide open," she said. And there’s no reason to believe he’ll ever run it any other way. I AM ONLY AN OLDER VERSION OF MYSELF AS YOU REMEMBER ME (I HOPE). WORK FOR THE SAME BOSS SINCE 1974 AND HAVE FINALLY GOTTEN TO THE POT AT THE END OF THE RAINBOW AND MY JOB REQUIRES VERY LITTE.. A DYNAMIC CHANGE. I WORK FIVE MINUTES FROM MY HOME SO NO TRAVEL TIME..HAVE A WONDERFUL NEW HUSBAND AND WE HAVE A PLACE AT MARK TWAIN LAKE THAT WE GO TO EVERY WEEKEND AND EVERY AVAILABLE DAY INBETWEEN. MY CHILDREN ARE GROWN OF COURSE WITH CHILDREN OF THEIR OWN AND RACHAEL LIVES WITHIN MINUTES OF ME AND JOHN LIVES IN LAKE SHERWOOD, ABOUT 20 MILES SOUTH OF WARRENTON. Graduated from HHS in 1961 and MU-Columbia in 1965 (degree in Business Administration). Worked at MU for 3 years, then went back to school and got Secondary Teacher Certification. Did student teaching at HHS under Wayne Thomas (bookkeeping). Decided teaching was not for me. Went back to work at MU in the College of Education Dean's Office for 5 years. Transferred to the Department of Music (now the School of Music) where I worked as the fiscal assistant for 25 years. Retired officially in March 2000. Over the years, I've traveled extensively with the American Business Womens Association. Have been to many cities in the U.S. and many foreign countries. Since retiring, I've done some traveling with Boone County Bank's Classic Club. Most recently (March 2007), I went on safari with 12 other Columbians to Kenya, East Africa. A great experience! I'm currently planning my second trip to New York City with this group. Another theater tour. Should be great. Our able "leader" is an HHS grad, Joy Rissmiller. I'm a member of Calvary Baptist Church, and I'm involved in several activities there. I'm presently Vice President of "The Evergreens", our Senior Adult Ministry. I am most fortunate to be living a colorful and active lifestyle! Presently, at age 63, I am healthy, fit, and work at a 5-star ski resort owned by Vail Resorts. No where near retirement...I have worked for 10 years at Jr. Ski School in Keystone, CO. I have a host of responsibilities dealing with children, parents, processing ski lessons, lunches, etc. etc. I take ski breaks during the day and cruise on the mountain! My husband and I use our days off to ski at Vail for free and have 50% off on food! Wow! In the summer, I am an ecology tour guide on the mountain. I take guests up the mountain on the chairlift starting at 9,400 ft., get off at 11,640 ft, and hike up to treeline (tundra) talking about trees in the area, history,animals, etc. I am also a historical tour guide. Here, I take groups all around the resort in a bus, starting with the old silver mining town of Montezuma. We discuss famous characters of the past, how the resort originated,the 'yellow gold'(gold)and 'white gold' (snow)of the area. It is a blast! My last tour served a group of sorority gals who graduated in 1961 from Colorado University. In addition, the summer jobs include Mountain Photographer. I carry the equipment with me everywhere and pose guests in the most beautiful settings! I also did the Dinner Wagon RIdes to an old historic ranch 4 evenings a week. My husband sold his Chiropractic business of 23 years last Oct./2005. He is a Wrangler driving the dinner wagon and sleigh rides to a historical homstead through a scenic mt. valley. He is an entertainer, and historian for the big conventions at Keystone(the largest center in the Rockies). He is a D.J. and dance instructor. We go to dude ranches weekly, eat fabulous food, and have a super time! Shortly after graduation I spent over 20 years in Omaha Ne. Was married and had 3 children. Divorced in 1977. Moved to Stillwater Minnesota in 1984. Remarried in 1998 and added 3 step children. Since 1987 I have owned American Residential Mortgage Corp. in Maplewood Minnesota. 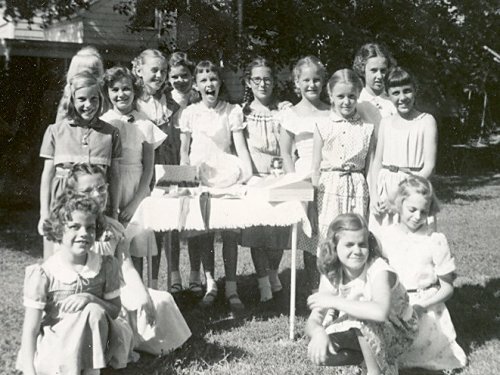 My 10th birthday party on July 9, 1953. The girls from left to right who are visible are: Sandra McKibben (Class of 1960), Linda Esmay, Judy Church, Sylvia Moser, Joan Lasley, Jenny Wilson, Nancy Brooker (give that kid a tranquilizer! ), Marion Cope, unknown, Sharon Ricketts, Kim Kabler, Linda Blewett, Sarah Zenge, and Katie Reid. To my knowledge, two of the group--Sandra McKibben and Sara Zenge--have passed away, sadly. I had requested chartreuse (hey, it was the 1950s after all!) icing to match my dress! I still have that card table and all the gifts my little friends gave me that day.